You’ve loved sipping that glass of red but now you have to deal with horrendous stains on your teeth? 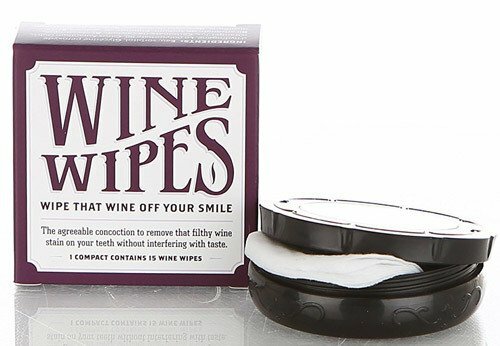 Wine wipes promise to erase those stains and clean your smile. The best products available on the market even have a pleasant flavor that doesn’t interfere with wine tasting. But what are wine wipes? And which is the best brand to consider? This guide tries to answer these questions and more. Yet, if you’re in a hurry, click on the links in the table below to check out the specs and features of our top picks. Why Invest In Wine Wipes? One of the best gifts for a lover of red wine, wine wipes are oral cleansing wipes designed to remove red wine stains from the teeth. Particularly useful during wine tastings or social gatherings, this product helps you maintain a beautiful smile when it’s not possible to brush your teeth. 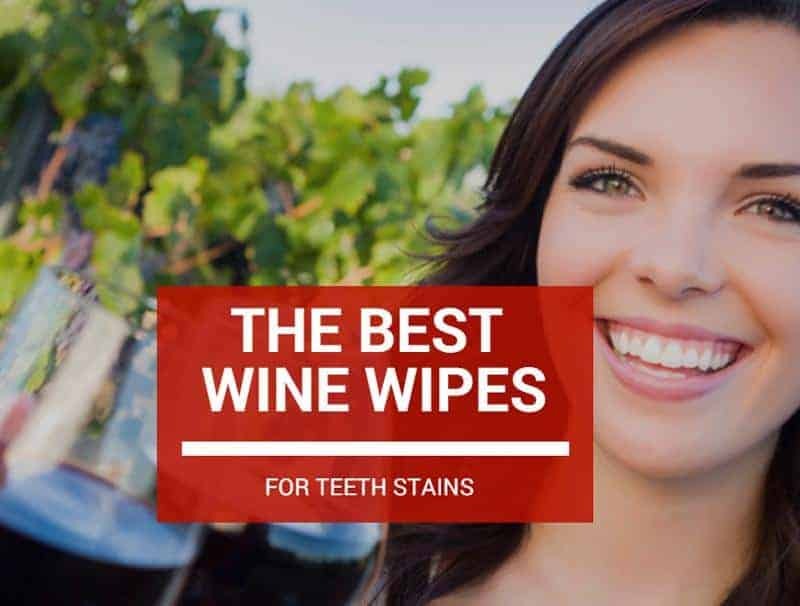 Since the original Wine Wipes emerged on the market, many other manufacturers started to produce teeth wipes; some of the wipes available on today’s market clean not only wine stains, but also stains of coffee, tobacco, and other foods or drinks. Similar to wet wipes, this product comes either in individually wrapped pouches or in compact cases with mirror. Whether you need wine wipes or not depends on your drinking habits. Are you drinking wine only at home? Or do you also enjoy a sip at the restaurant or at your friend’s party? To be honest, I’ve never met a wine lover who refused a glass of good red just because they weren’t at home. But red wine stains your teeth regardless of where you drink it. And while it’s easy to brush your teeth when you’re drinking at home, it’s unlikely to carry a toothbrush and toothpaste with you at social gatherings or wine tastings. On these occasions, it’s easier to have a wine wipe in your handbag or pocket. Easy to use, discreet to carry, and very easy to dispose of, wine wipes will help you have a brilliant smile at all times. And the only downside of wine wipes is that they rub off lipstick too. This could be less appealing to our lady friends, yet it’s more convenient to put on new makeup than showing an all-stained smile. There are two types of wine wipes on the market. And even if this article is dedicated to only one type, you should know what options you have… just in case. Oral cleansing wine wipes are the ones described above. As their name suggests, these wipes are used to clean your teeth and palate after drinking wine or other drinks that stain the enamel, such as coffee or tea. These wipes can also be used with success after smoking or chewing tobacco. According to the manufacturer of the original Wine Wipes, to achieve the best results, it is indicated to rub your teeth with a wipe before consuming staining drinks or foods, then rub your teeth again after consumption. While this practice makes it easier to clean your oral cavity, we’ve found that rubbing your teeth only after eating or drinking also has satisfactory results. Stain removing wipes are also designed to remove wine stains but from fabrics. There are dozens of brands to choose from and the wipes are soaked in a cleansing agent that remove wine stains from garments and upholstery. Easy to use and dispose of, these wipes are particularly useful on the go; after all, incidents can always happen and it’s easier to clean a fresh stain that a dry one. The only thing to pay attention to is the action of the wipe on your garments. It is recommended to first clean a small piece of fabric in a hidden area and see if there is any discoloration. In most cases, stain removing wipes are formulated to act on stains alone, but it’s always good to check beforehand. 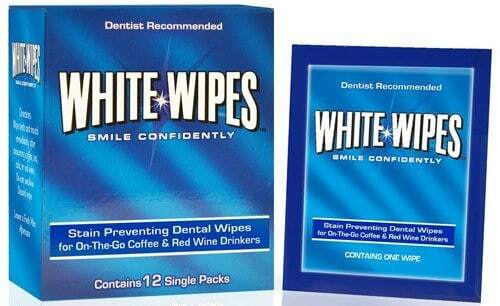 Among the many wine wipes we’ve tried, the ones we liked best are the White Wipes - Teeth Whitening Wipes. Formulated to clean stains of red wine or coffee, these wipes come wrapped in individual pouches, and a box contains twelve pieces. Easy to carry in a handbag or pocket, these wipes are discreet and easy to dispose of. Made to prevent enamel discoloration and to maintain a good oral health, this product is approved by dentists and is very easy to use. Leaving you with a confident and radiant smile, the wipes are also formulated to freshen up your breath. Just wrap the wipe around a finger and rub it on your teeth for a quick removal of all stains. Made in the USA, these wipes are safe to use and free of harsh chemical agents. The whitening agents are peroxide and sodium bicarbonate, which is the same substance found in baking soda. The flavoring agents are the preservatives are also similar to those used in toothpaste. Agents: these whiting wipes are made with food-grade ingredients which are found in most toothpaste. The main whiting agents are the peroxide and the sodium bicarbonate. Package: the wipes come in a box of 12 and each wipe is individually wrapped in a pouch. This makes it easy to carry them in a pocket or purse. Aftertaste: the flavoring agent leaves a fresh mint aftertaste that freshens up your breath. This is great after drinking red wine, tea, or coffee. Action: these wipes are made to act on more than wine stains. They effectively prevent enamel discoloration produced by wine, coffee, tea, or other foods and drinks. The product contains sorbitol, which could be a drawback for people suffering from allergies or intolerances. 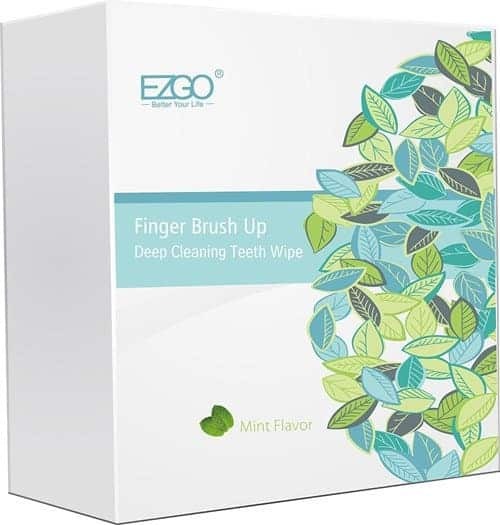 If you’re looking for convenience, EZGO Deep Cleaning Teeth Wipes brings great value for money. Coming in a pack of 100 pieces, these wipes are individually packed and very easy to use. An innovative design makes it easy to place the wipe on your finger and rub all stains and residues off your teeth. The product is easy to use without any water, which means it’s enough to find a discreet place to clean your oral cavity, even when there is no restroom around. A sugar-free formula makes the wipes ideal for all users, including people suffering from diabetes. Another thing we like is the aftertaste. A fresh mint flavor adds freshness to the breath and leaves the mouth feeling clean. However, the strong mint aftertaste interferes with the taste of the wine, therefore we wouldn’t recommend using these wipes during a wine tasting event. Apart from this minor drawback, the wipes do exactly what they are supposed to do and come with a 100% money back satisfaction guarantee. If you don’t like the product for any reason, just contact the manufacturer to claim a full refund. Sugar-free: safe to use by all people, the wipes have a sugar-free formula. They are safe for people suffering from diabetes. Easy to use: with a “pouch” design, the wipes just fit on the finger for an easier cleaning of the teeth. Portable: each wipe is packed individually; they are easy to carry in a pocket or purse and easy to dispose of after usage. Satisfaction guarantee: the product comes at an excellent retail price and is backed up by a 100% money back guarantee. The wiping side seems flimsy. Designed specifically to wipe away wine stains, True Wine Stain Removing Wipes come in a pack of 12 individually wrapped wipes and are ideal to use during wine tastings. The main difference between this product and those not designed specifically for wine is the flavor and aftertaste. In fact, these wine wipes have a delicate orange blossom aftertaste that freshens your breath and cleanses your palate between one sip and another. The orange blossom flavor doesn’t alter the perception of wine flavors and aromas. Coming in an attractive vintage package, the wipes are also great to use on lips. They remove lipstick too but certainly wipe away the unflattering red wine stains. Moreover, the wipes are great to use for multiple purposes, including to clean coffee or tea stains. Perfect for all wine lovers, this product makes a wonderful gift. The price is also great and in the end, we just love that these wipes are designed specifically for wine lovers. Aftertaste: these wine wipes have an orange blossom flavor that doesn’t interfere with the flavors of the wine. Great to use during tasting events. Package: coming in a box of twelve, these wipes are wrapped individually and come in an attractive pack with a vintage design. Usage: thanks to the neutral flavor, the wipes can be used either during or after a wine tasting event or wine party. Price: these Wine Wipes come at an affordable price; they are easy to use and easy to dispose of. The orange blossom flavor is neutral for wine tasting but less pleasant to the palate than mint. Produced by the same manufacturer as the wine wipes above, these Wine Wipes come in a sleek compact case that contains 15 wipes and a mirror. Ideal for ladies but also elegant enough to fit well in a men’s handbag, these wipes come with a few differences. Made of natural ingredients, the wipes are formulated to clean wine and coffee stains from the teeth. But they are not flavored, which means you’ll be left with a sodium bicarbonate aftertaste, which alters the flavors of wine and that is unpleasant. On a positive note, the wipes are amazing in cleaning away all stains. They prevent enamel discoloration and the compact case with mirror makes them easy to use in a discreet place regardless of where you are. Ideal for traveling, the designer’s case is made of metal. Another thing we don’t really like is the bulk package. On one hand, it’s nice to have all wipes stored in a nice case which is easier to find in a bag. On the other hand, the wipes dry out quite quickly once you’ve opened the case. So, that’s a thing to account for. Designer’s case: these wine wipes come in a beautiful designer’s case which is made of metal and has a fitted mirror. Easy to find: the compact case is easier to find in a bag then individually wrapped wipes. It is also more elegant. Ingredients: the wipes are made of natural ingredients. The active components are sodium bicarbonate, hydrogen peroxide, calcium, potassium, and glycerin. Gift: these Wine Wipes make an ideal gift for a red wine aficionado. The compact case comes in a stylish gift box with vintage design. The sodium bicarbonate aftertaste is unpleasant to the palate. 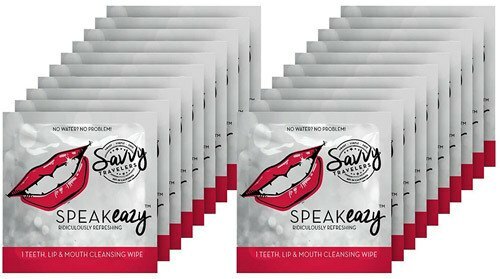 Last but not least, Speak Eazy teeth and mouth-cleansing wipes by Savvy Traveler is another product to consider. Formulated to wipe away coffee and wine stains, these wipes are travel-safe and carry-on friendly. TSA compliant, biodegradable, and compostable, the wipes are made in California with environmentally-friendly technology. Designed to work on lips, tongue, and teeth, the wipes interfere with wine tasting and we recommend using them when the event is over. Nevertheless, the fresh mint aftertaste sweetened with natural Stevia plant extract leaves a pleasant flavor and freshness on the palate. We also like the cruelty-free certification. The product is not tested on animals and contains mostly natural ingredients. Moreover, due to antimicrobial properties, the wipes prevent the formation of plaque and effectively remove the unpleasant film that builds up on teeth after drinking wine or coffee. Coming in a box of 20, the wipes are wrapped individually and easy to carry in a handbag or pocket. Refreshing: boasting a cool spearmint aftertaste, the product leaves a fresh, pleasant aftertaste. The wipes can be used on lips, tongue, and teeth. Textured: designed to remove plaque, the wipes are textured and effectively wipe away coffee, wine, and food stains. Travel-friendly: the product is carry-on friendly and TSA compliant. Individually wrapped wipes are easy to transport. Environmentally friendly: these wipes are made in California from compostable ingredients and using solar power renewable energy. This is also a cruelty-free product. The spearmint aftertaste alters the aromas and flavors of the wine. We wouldn’t recommend using the wipes during a wine tasting event. We’ve tried many wine wipes during tasting events, and from all, the White Wipes - Teeth Whitening Wipes are out favorite. This product is slightly more expensive than the others available on the market, but its quality pays off. The pack contains 12 individually wrapped wipes that remove not only red wine stains but also stains of coffee, tea, or food. Easy to carry and dispose of, and discreet to use, these wipes contain natural ingredients and are made to leave the teeth clean. Ideal to freshen up your breath, the wipes leave a pleasant mint aftertaste. Yes, this alters the flavor of wine, therefore it’s recommended to only use them when tasting is over. Approved by the dentists, the wipes contain hydrogen peroxide and sodium bicarbonate, two powerful whitening agents found in toothpaste. 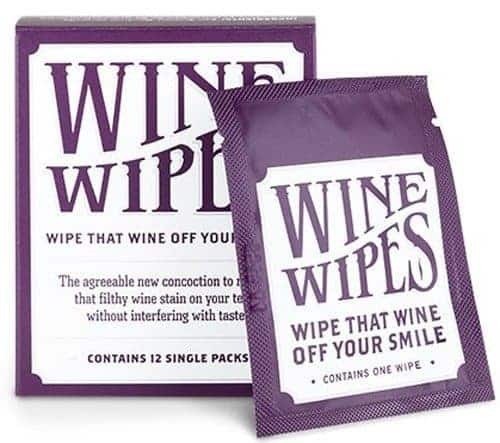 Undoubtedly, these wine wipes do an amazing job in cleaning your mouth on the go. Just toss a few individual pouches in your bag or pocket for an accessible refreshing method you can use no matter where you are.